Most manufacturing companies face challenges with synchronizing demand and supply due to dynamic mix of large- and small-order quantities; hybrid mix of make-to-stock, make-to-order and engineer-to-order products; high-product variants etc. Spread sheets based planning and scheduling solutions are inefficient in most manufacturing process today and the need is to look for advanced solutions that will help improve production planning and scheduling. Advanced planning and scheduling systems such as Preactor from Siemens helps you to consider multiple constraints bringing in better visibility of the shop floor to balance supply and demand and improve coordination among sales, purchase, production and planning to follow a single plan. What is the priority of requirement for an APS solution? What Potential Solutions are you looking for to solve your challenges? Do you use Excel for Production Planning and Scheduling? 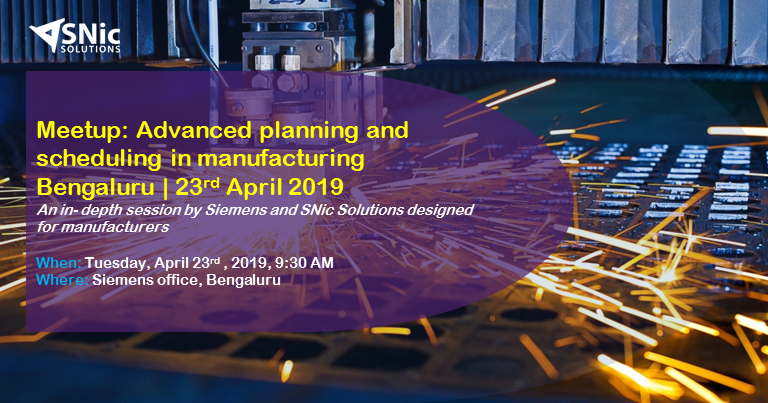 The workshop is sponsored by Siemens and driven by SNic Solutions, a well-known Advanced Planning and Scheduling Subject Matter Expert in India. *A maximum of two delegates from a company are allowed for this session. SNic Solutions is a management consulting firm and a Silver Smart Expert partner to Siemens. With more than 100+ clients globally, they have proven technology expertise in advanced planning and scheduling in the manufacturing industry. * Limited seats are available.